Some of the most memorable craziness in Alice in Wonderland by Lewis Carroll is the several size shifts Alice goes through at various points in her adventures. This occurs via drink, cookies, cakes, and...mushroom! (Totally reminds me of a certain be-'stached plumber...). The condescending, hooka-puffing caterpillar tells Alice that one side of the mushroom he had recently been lounging on will make her grow, and the other side will make her shrink–though determining sides of something round is a bit tricky! 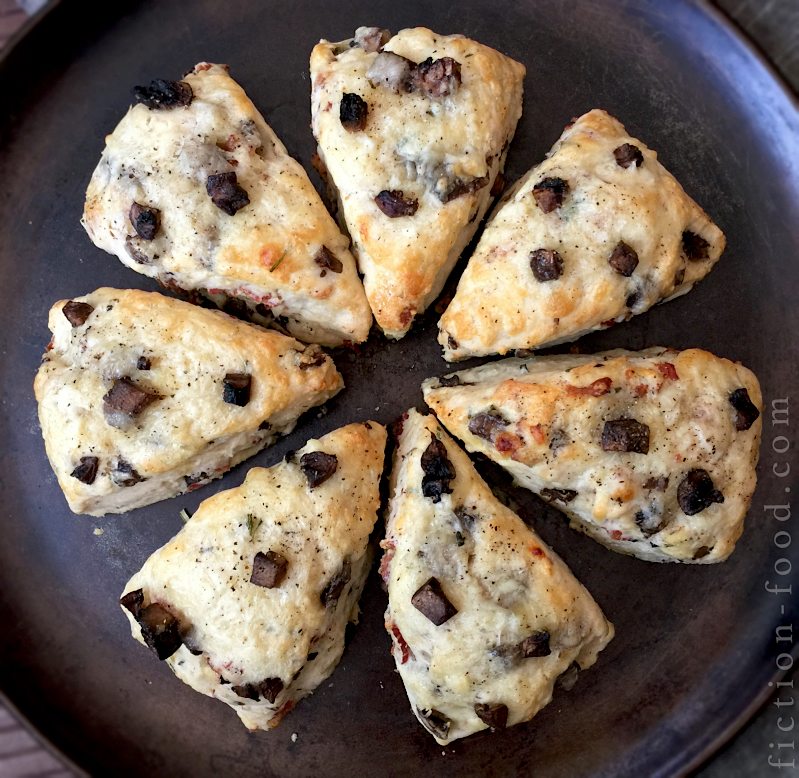 In the classic Disney animated adaptation, the pieces of mushroom Alice removes look like wedges or triangles, so I thought scones would be perfect! Also, scones make me think of tea which is a Wonderland staple, though these scones are savory. Further along in the story Alice encounters a cook who loves pepper (I made cookies for that!) and a baby that turns into a pig, so I also incorporated these elements into my recipe below, but they are completely optional. 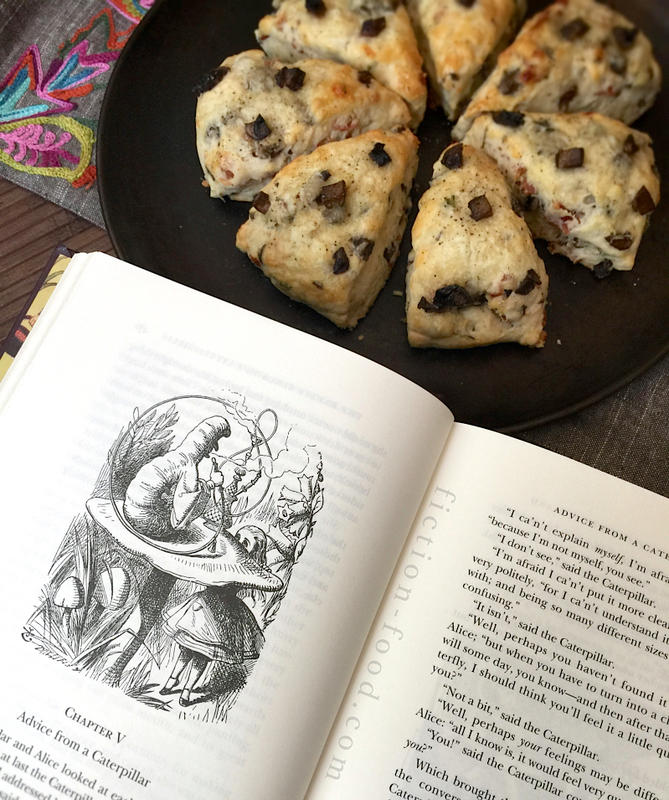 Check out the Alice in Wonderland episode of Fiction Kitchen Podcast where we talk more Alice food! And make sure you visit the official website for the 150th anniversary of Alice in Wonderland! 1. Pre-heat your oven to 450ºF. Heat the oil in a pan over medium-high heat & add in the mushrooms, Cook for about 3 minutes, stirring around, & then remove from heat & turn the mushrooms out onto a paper towel-lined pate to cool. Pat the mushrooms with the paper towel. 2. In a med-large bowl whisk together the flour, baking powder, salt, optional pepper, & fresh rosemary. Add the butter cubes & cut or mix in with your fingers until crumbly. Next, mix in the cheese. 3. In a liquid measuring cup or small bowl, whisk together 1 egg & half & half, & then stir it into the flour mixture along with the mushrooms & optional bacon. Stir until a dough forms & then shape it into a ball. 4. Turn the ball out onto a lightly floured work surface & press it down evenly until it becomes a thick disc. Cut it in half, form 2 balls & then flatten them both into about 6" diameter discs. Cut each disc into either 6 or 8 wedges & then transfer them to a parchment-lined tray. 5. Whisk the remaining egg with the 1 Tbsp. water to make an egg wash & then lightly brush the wash on the top of each wedge. Sprinkle a little shredded cheese on each wedge, & then optionally lay a mushroom slice on top of each one. Slide in the oven & bake for about 12-15 minutes or until golden brown. Remove from oven & serve the wedges in a circle with a butter on the side (we caught a bread & butter-fly!). Oo! Stuffed mushrooms sound so good! and great for Alice! 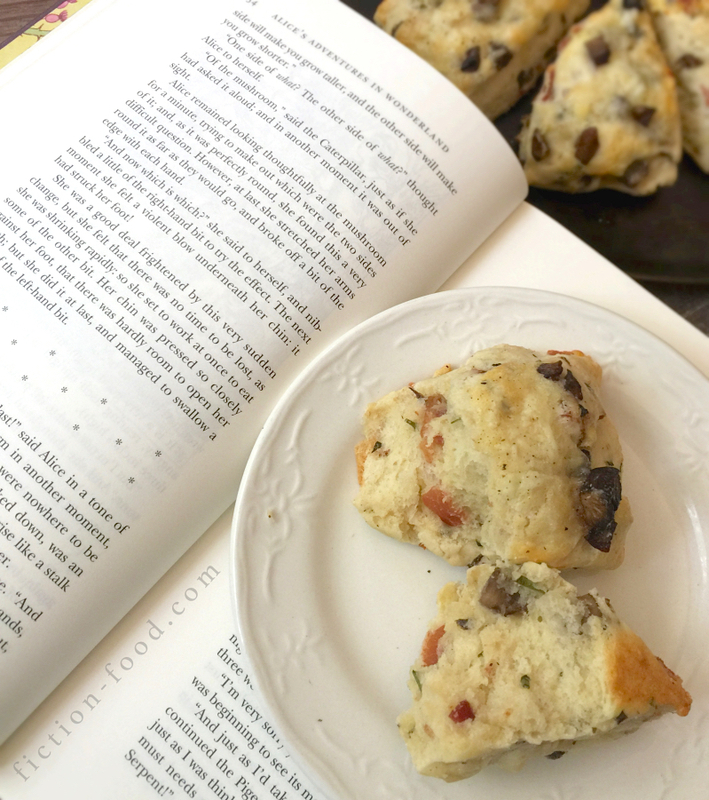 I've done my share of savory scones but never with mushroom, so I am SUPER into these! They look wonderful. I'll have to try them soon.